Email marketing is relevant and effective even after decades of its inception. And it is expected to remain so in the future. This review of GetResponse introduces you to a proven, all-in-one marketing platform that was the first to introduce complete webinar marketing solution within an email marketing platform. Explore its main features and find out why it is a comprehensive marketing solution for your business. The key to succeeding with email marketing is to reach your target audience at the right time with the right message. With GetResponse, you can segment your subscriber lists and target your message to each group with similarities. You can design relevant and elegant emails with dynamic content (personalized details) to reach the right segment at the time they are most active. Advanced Segmentation: Segment by common features to send relevant messages. Geolocation, subscription source/date, engagement levels, and custom data are the different factors. 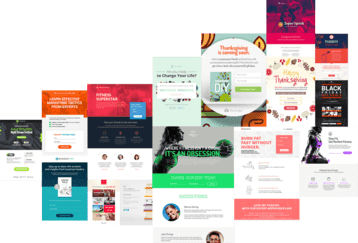 500+ Templates: Use an easy drag-and-drop editor and access 500+ professional-designed templates to create your custom email message. Access to 1000+ iStock images further ensures that your message is unique. Mobile Preview: Preview your email message in all the different devices even before you send them out. Autoresponders (Automation): Let your marketing communication work on auto-mode. Continue the conversation at the right time with right actions. Keep Track: Keep track of the opened, clicked, and successful-sales messages. Access powerful analytics tools to get real-time information about your email campaign’s performance. Perfect Timing: Reach them when they are most active with their email inbox. Time Travel: Reach your target audience in another time zone at their appropriate time. 99% Deliverability: GetResponse has industry-leading deliverability rate due to the trusted brand name. While the story of most email marketing service providers ends here, this is just the beginning of the long list of tools and features of GetResponse. With GetResponse, you can create sales pages, download pages, promotional pages, and opt-in pages for your email campaigns. So whenever someone clicks on the link within your message, you can take them to a landing page that provides them useful and relevant content. Responsive Templates: Choose any of the hundreds of landing page templates and start editing them with create a custom page. All the templates are responsive and render efficiently on mobile devices. You can also choose from 1000+ iStock images for free and use an image editor to customize the images when adding to the landing page. Simple Drag-and-Drop Editor: Similar to the simple drag-and-drop editor for email templates, the landing page templates can also be customized using an intuitive editor. A/B Testing: Test each element on your designed page before you host it. Hosting is available with GetResponse’s sub-domain or you have the flexibility to choose any one you like. 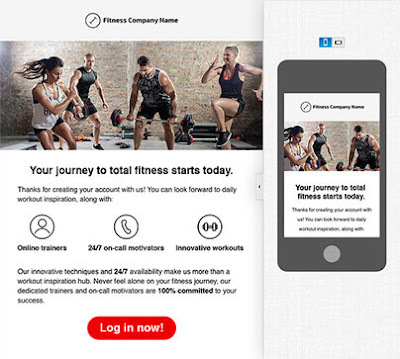 Add Webforms: You can also add webforms into your landing page to capture data and leads. Add custom fields based on your requirements. Third-party Platforms: You can also link third-party remarketing and analytics tools into your landing pages. Embed videos, ecommerce (buy buttons), and social media sharing buttons. With its complete webinar marketing solution, GetResponse allows you to take email marketing to the next level. Boost your conversion rates and engagement and get more leads and sales. Setting up webinars is quite easy. There is lots of flexibility as to how you want to control the attendees from logging-in. Protect everyone with secular SSL URLs and add credibility and trust to your business image. GetResponse’s webinars are mobile-friendly and you can have your attendees joining from their iOS or Android devices. There are webinar video recording options, free online store, text chat feature, polls, whiteboard, and in-webinar video features to take engagement to the next higher levels. 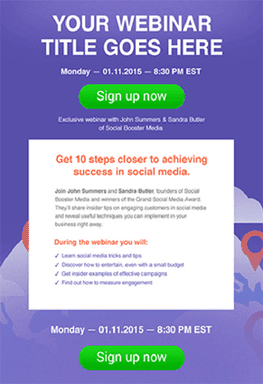 And with the option to share on social networks, you can spread your webinar among everyone who follows you. The recorded events can be shared to drive more traction. You can also use autoresponders within this feature to nurture the registrants. However, that is not all that GetResponse has to offer. It also provides an intuitive marketing automation platform so that your marketing communication keeps taking place based on your set rules. Whatever scenarios you can come up with, GetResponse’s marketing automation feature can help turn them into effective communication actions. It is also powered by a simple drag-and-drop workflow builder that can be used by anyone. In fact, you can create hundreds o scenarios and take communication actions based on your users’ actions. Workflows can be built with blocks. 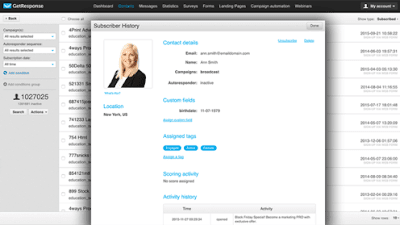 Track user behaviors and take actions such as sending emails, adding to or subtracting scores or tagging. There is so much to GetResponse that it is not just an email marketing tool. You can use it for driving your complete online marketing communication throughout the sales journey of your target audience. Reach them out with the right message at the right time based on where they are in the sales funnel. It helps put your marketing communication on auto-mode, taking things years beyond the conventional email marketing concept. It is truly an all-in-one marketing platform designed for small to large enterprises. Let your target audience know your business better.